The island foxes on Santa Catalina Island face different survival challenges than the foxes on the northern islands. In 1999, the Santa Catalina island fox population declined by over 90%. Only approximately 100 foxes remained because of an outbreak of canine distemper virus. In this emergency situation, the Catalina Island Conservancy (CIC) and the Institute for Wildlife Studies (IWS) created a captive breeding facility to help reestablish a stable fox population. Twenty-two island foxes from the West End of Catalina Island, where the animals were unaffected by the virus, were translocated to the affected East End. A distemper vaccination program was also implemented. After several successful years, captive breeding efforts concluded in 2004. Since then, the Catalina island foxes have been recovering their numbers in the wild. 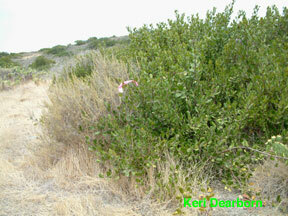 Foxes are counted by setting cage traps in specific places, such as the location marked by the colored tag on this bush. The total number is estimated from individuals that are caught. Trapping also allows biologists to check the health of individual foxes and vaccinate them against distemper. 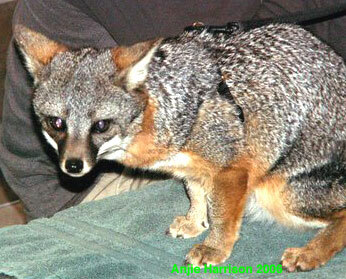 The CIC estimates in 2007 that there are approximately 500 island foxes on Catalina. This population is doing well but still has a long way to go to reach the pre-outbreak estimate of 1,342 foxes. Today, however, the Catalina island fox is facing new threats. Since 2001, over 37 foxes have been found with cancerous ear tumors (Ceruminous gland carcinoma). These mysterious ear lesions are typically fatal. 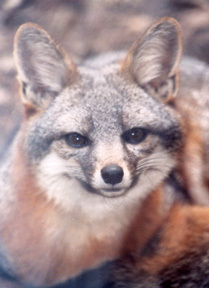 Currently, the Catalina island fox is the only subspecies with this disease. The Catalina Island Conservancy is supporting research that is being conducted by IWS and the University of California, Davis to determine the prevalence and possible causes for this cancer. The island foxes on Santa Catalina also have the challenge of sharing their island with people and domestic pets. 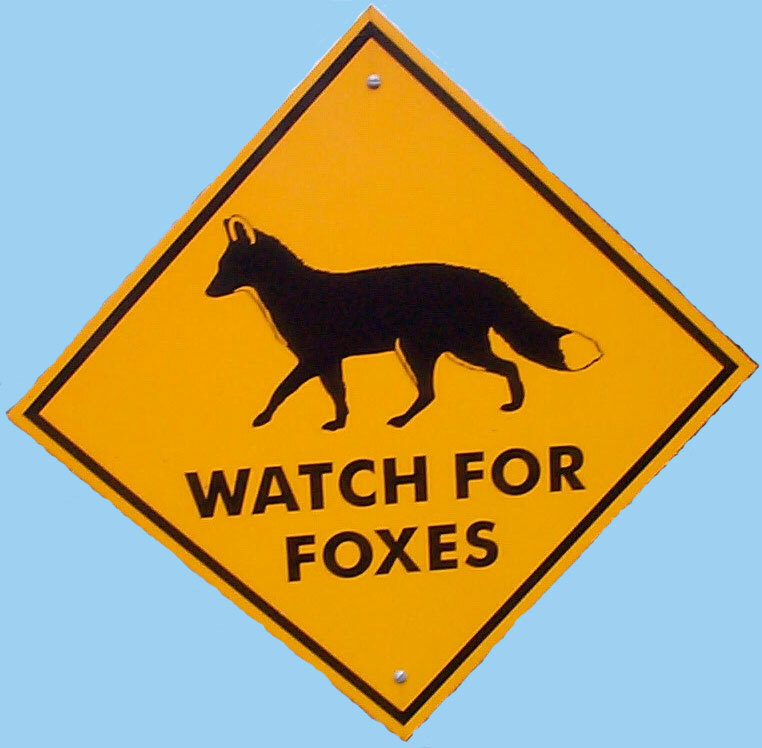 Cars on the few island roads have been responsible for 9 fox deaths in the past two years (2005-2006). While three more foxes were attacked and killed by domestic dogs. Signs warning “Watch for Foxes” are one way to alert drivers and new pet policies for the interior of the island require residents and visitors to vaccinate their pets, keep them leashed and to clean up after them. 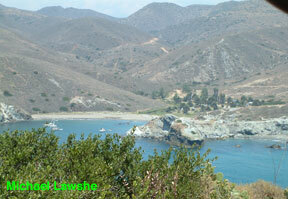 When visitors dock their boats in Catalina’s harbors they may not be aware of the island fox, just on shore. Friends of the Island Fox hopes to support the Catalina Conservancy in further island fox disease research and public education to help the residents and visitors on Catalina Island understand their role in providing a safe habitat for island foxes. You’ll have a chance to see the island foxes and some of the devoted people from the Channel Islands National Park working to save this endangered species.